IC410 lies about 12,000 light-years away in the northern constellation Auriga. The cloud of glowing gas is over 100 light-years across, sculpted by stellar winds and radiation from embedded and rather small open star cluster NGC 1893. The radiation from these hot stars pushes the gas away from them and creates the darker hole like features. The "tadpoles" are regions of denser, cooler gas. These resist the erosive radiation from the hot stars. The high radiation slowly eats away and the matter streams away from the stars creating the tails seen in the image. Potentially sites of ongoing star formation. 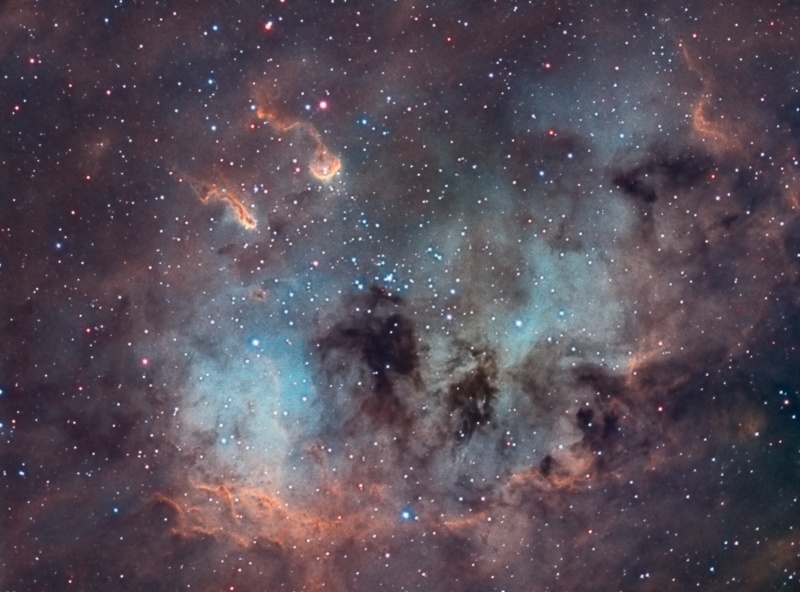 This is a false color image using Hubble Palette, created from three narrowband filters: Ha, S2 and OIII. IC410 se encuentra a unos 12.000 años luz de distancia en la constelación de Auriga. La nube de gas resplandeciente tiene más de 100 años luz de diámetro, y es esculpida por los vientos estelares y la radiación del relativamente pequeño cúmulo abierto NGC1893. La radiación de estas estrellas calientes empuja el gas lejos de ellos y crea agujeros y formas en el gas. Los "Renacuajos" son regiones más densas y frías de gas. Estos resisten la erosión de la radiación de las estrellas que poco a poco se come y lanza la materia desde las estrellas, creando las colas de los "renacuajos" de unos 10 años luz de largo que se ven en la imágen. Estos son lugares potenciales de creación de nuevas estrellas. Esta es una imagen en falso color en Paleta Hubble, creada a partir de tres filtros de banda estrecha Ha, SII, OIII. 1.- Captured using standard methods and techniques. Three days narroband images, Ha (Baader 7nm), OIII and S2 (Baader 8nm). Note: some days later I discovered my f/4 telescope was out of collimation during these shots (!). 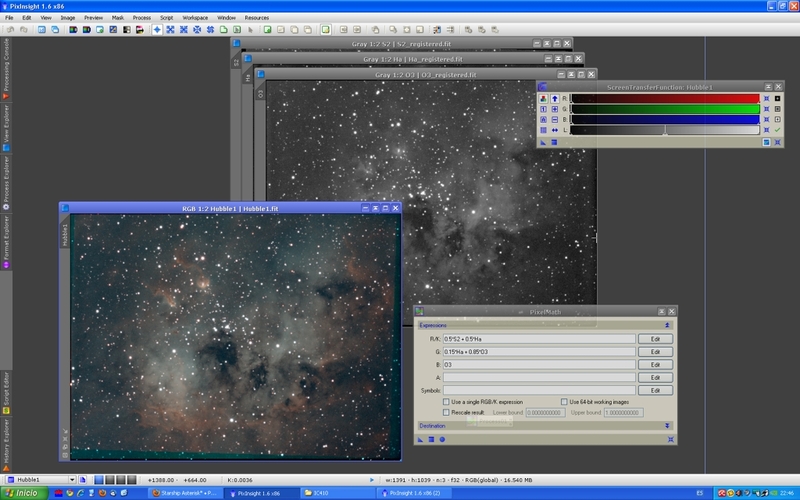 2.- Separate calibration, registration and integration of each set of shots using PixInsight Core 1.6. Standard masked histogram stretch for the resulting three images. 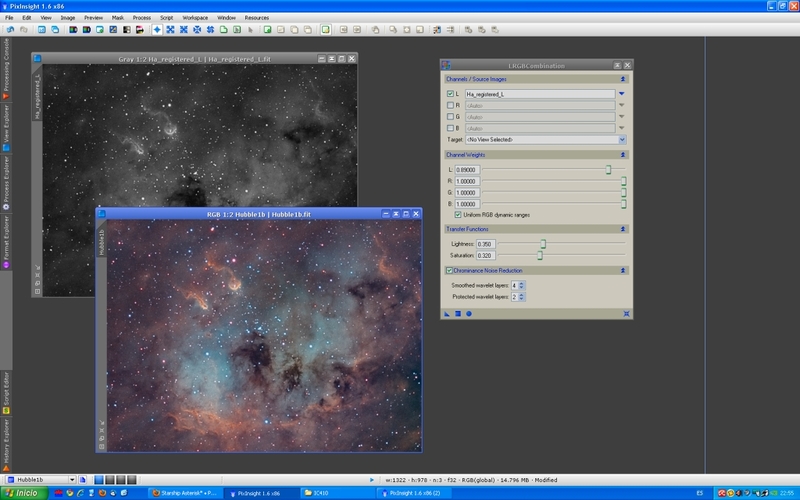 All further process was done with PixInsight Core 1.6. 5.- High Dynamic Range Wavelet Transformation (HDRW) on 2 layers over a copy of Ha image obtained in step 2. ACDNR masked noise reduction applied. Masked Morphological Transformation (erosion), applied only to stars to reduce its size. 6.- LRGBCombination, using the modified Ha image obtained in step 5 as Luminance at about 90%, and narrowband color combination obtained in step 4 as chrominance. Chrominance noise reduction applied. Lighness and saturation slightly adjusted. 7.- Masked curves adjustment and ACDNR final masked noise reduction applied. This is not a silver bullet nor is expected to be a perfect processing technique, but it's what I did and hope this help to anyone to give a try on their narowband shots. No dark. 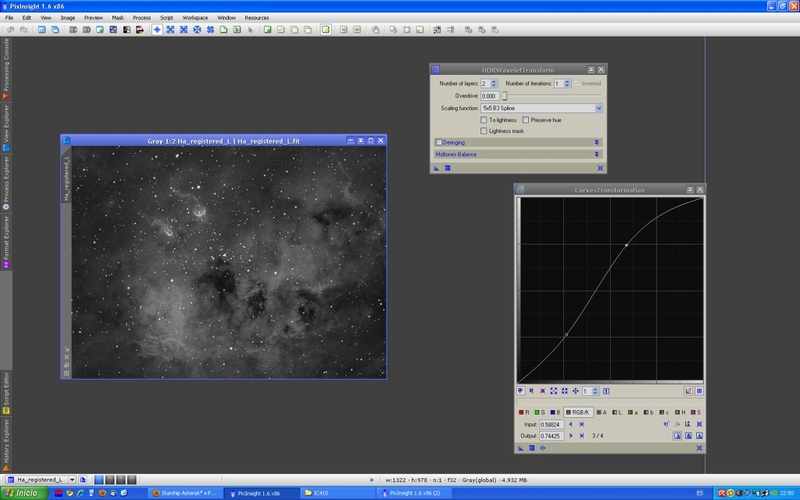 Calibrated, registered and integrated with PixInsight. PixelMath to create Hubble Pallete with Ha, OIII and SII. LRGB combination using Ha. ACDNR. LRGB=0.84L(Ha, HDRW 2), 0.36 Lightness, 0.39 saturation. Chroma NR. All Contents Copyright by Jaime Fernández and Copyright of their respectives owners. Text mainly extracted from Wikipedia. otherwise I beg you for a fair contribution to NGO Medicos Sin Fronteras proportional to the profit obtained. Este sitio web usa cookies para su funcionamiento. No utiliza cookies publicitarias ni de personalización. (IP origen, fecha y hora, página visitada y términos de búsqueda usados).